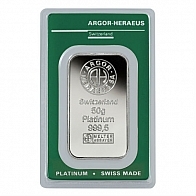 100 Gram Argor Heraeus Platinum Bar. Each bar contains 100 grams of 999.5 fine investment grade platinum bullion. 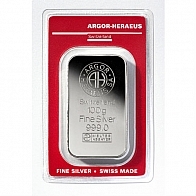 The Argor Heraeus platinum bar features the Argor Heraeus logo at the top, with the weight, fineness and metal below. The reverse of the bar features a repeating Argor Heraeus logo. All bars are sold sealed in a plastic certicard. 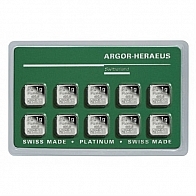 Argor Heraus is one of the largest precious metals refineries in Switzerland, and they produce bars in gold, silver, platinum and palladium for precious metals investors. They also produce all the precious metals products sold by UBS. 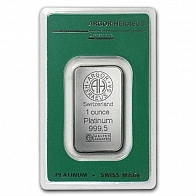 SwissBullion.ch sell the 100 gram Argor Heraeus platinum bar for VAT-free Swiss storage or for delivery.